It is with heavy hearts that we once again have to announce the passing of a great friend of ours from the racing community. Today, we lost our friend Mike Romeo, who battled severe injuries from a car accident in Bucks County for almost two days until ultimately losing the battle and passing on. Mike was hands down one of the nicest people we had ever met, always wearing an infectious smile at the track whether win or lose. He was often found not in his own pits, but in others’, helping out his friends or any racer in need. 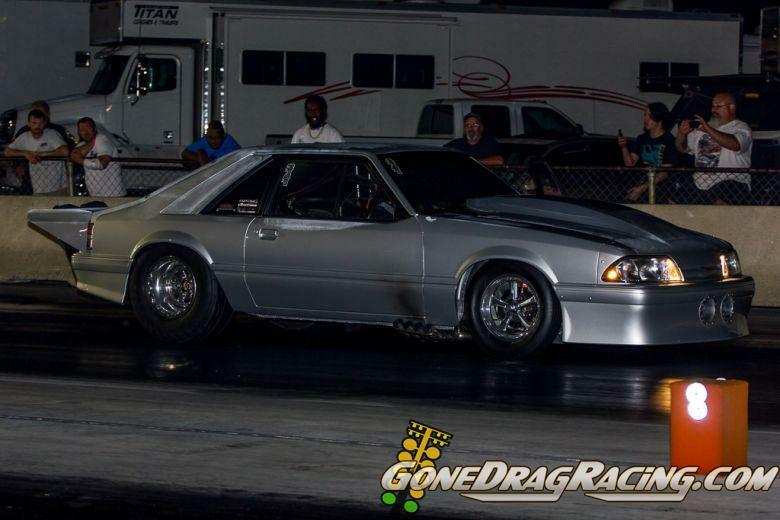 Mike had numerous track championships under his belt in the 10.0 Index class with his trademark Camaro, and also dabbled in 8.50 Index in the past until joining it full time in 2012. 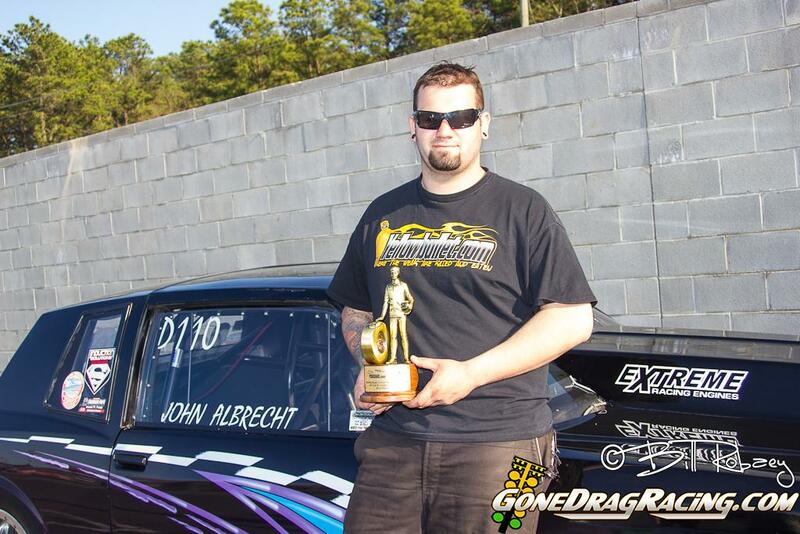 Mike is currently the points leader in 8.50 Index at Atco Raceway. On a personal level, Mike was one of the racers at the track that always brightened my day, making it worth it to travel each weekend to cover heads up races. Always with a smile on his face whether he was going rounds or knocked out early (a rare occurrence), I am going to miss him dearly both on the track and off and will miss seeing the smile on his face during each and every launch through my camera. We wish our deepest sympathies to the entire Romeo family during this tough time. 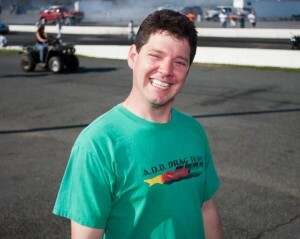 A support fund has been created by Harry Gerb from H&J Motorsports, please click here for info. The funeral will be on Tuesday, August 14th at St Vincent de Paul Church on Hatboro Road in Richboro, PA, opening at 9:15AM and service beginning at 11:30AM. Burial will be at Sunset Memorial Park in Huntingdon Valley. 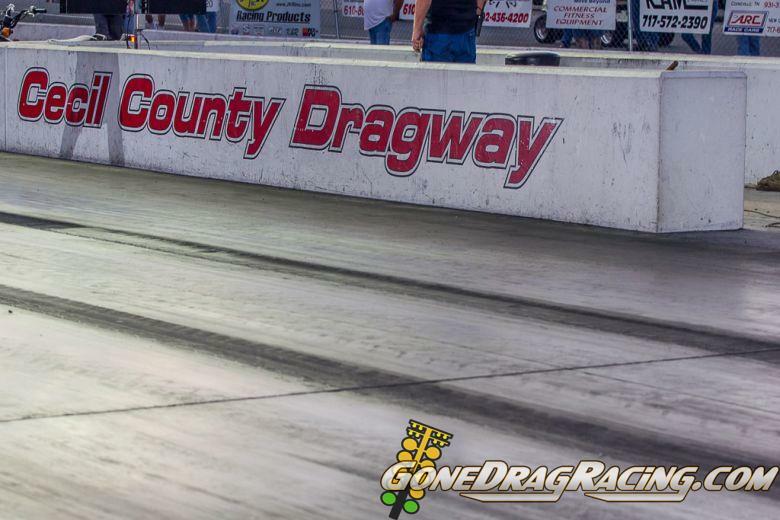 The heat at the last Cecil County Dragway – Finishline Performance Outlaw Street Car Shootout was intense and although the heat did cool off a bit the racers were out in full force trying to take out the #1 racers in each and every class! 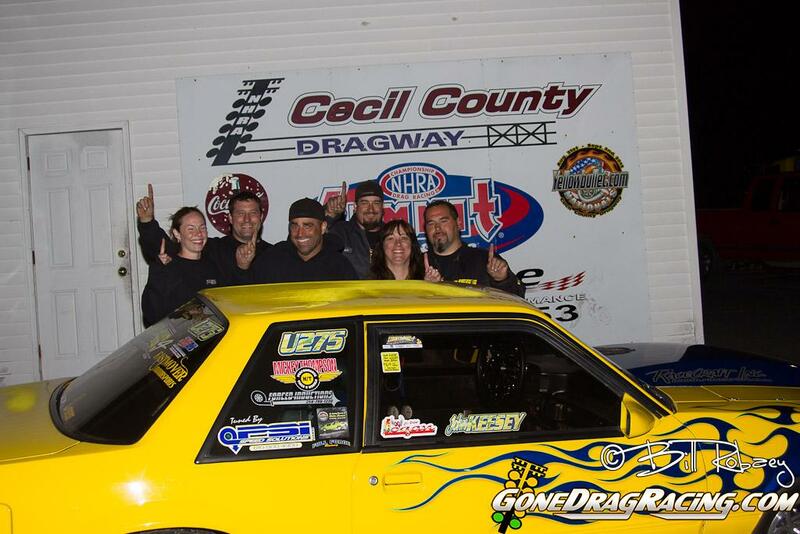 The crew at Cecil were up to the task getting the track to work for the Streetcar Shootout racers and that was evident with the low numbers in qualifying. 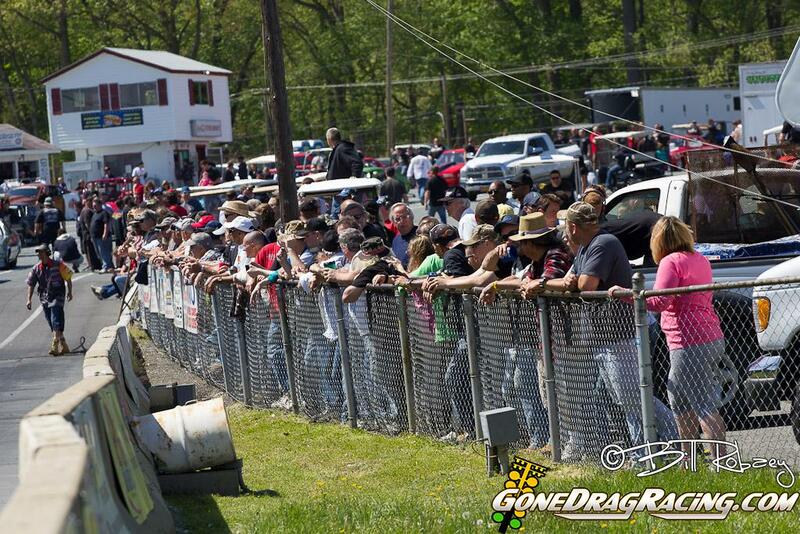 The Northeast has some of the most dedicated and hard working racers around and those who follow the Cecil County Outlaw Streetcar Shootout fans and racers alike know that when they show up each and every first Saturday of the month they will be in store for some of the greatest and close racing around! Click here for the photo gallery with over 700 images of the race! 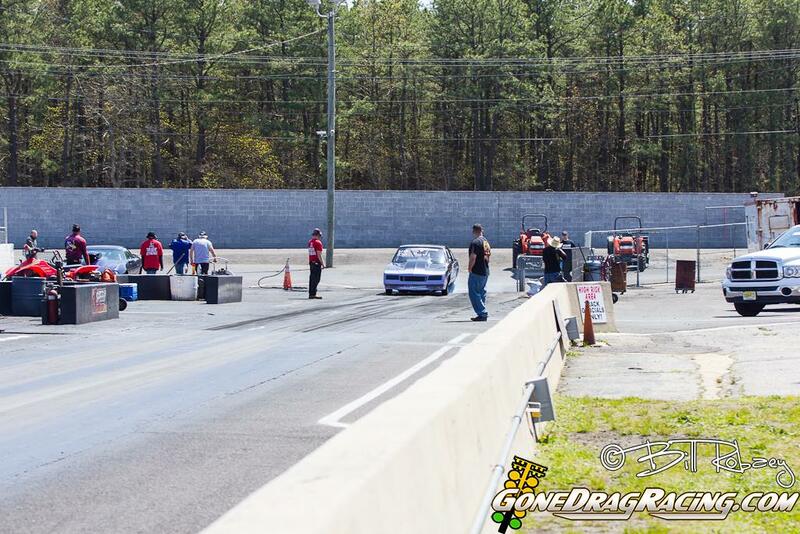 Outlaw 10.5 the premier class here at Cecil County Dragway in the Finishline Performance Outlaw Street car Shootout series saw twenty cars on the property trying to qualify for the 16 car field. 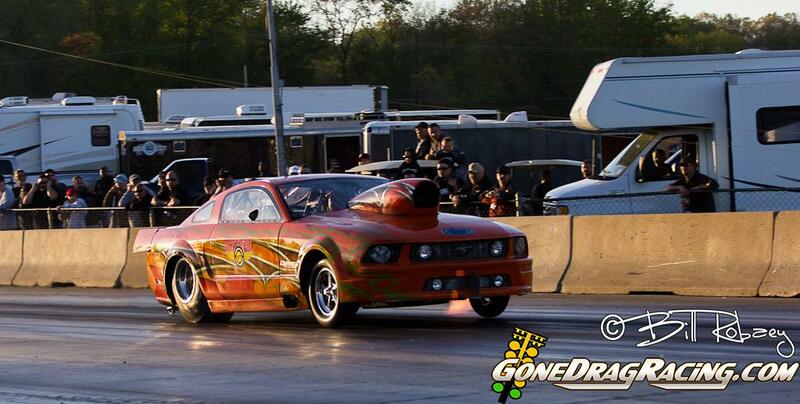 Billy Gordon took the #1 qualifying spot with a 4.319 at 184 with T.J. Kasper right behind him with a 4.336 at 182. Lou Sciortiono held the #3 spot on the qualifying ladder with a 4.353 at 168. 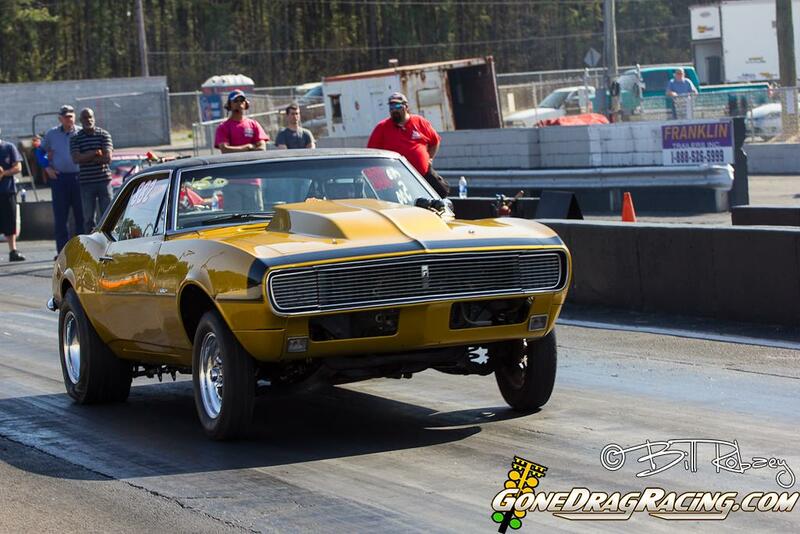 Harry Buck Jarvis who had a bad crash at the 2011 Yellowbullet Nationals recently has been seen testing at Atco Raceway with his 1969 Camaro and came out swinging and was able to put up a stout 4.356 at 187. 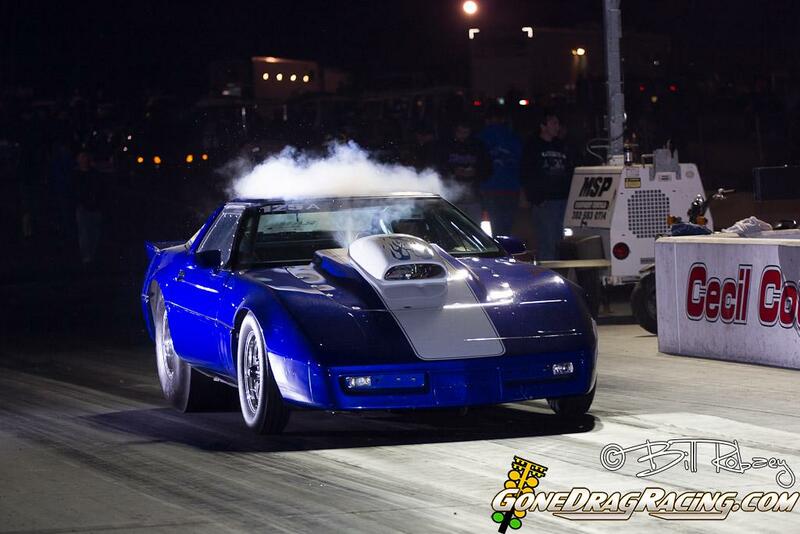 Mo Hall in his Fulton powered big block ran a 4.36 at 168 held the #5 qualifying spot with Larry Wood in his beautiful Proline Powered 2010 Corvette #6 at 4.381 at 184. Charlie Dolbin running the Caldwell Motorsports Nitrous fed 2005 Mustang pulled in the #7 qualifying spot with a 4.383 at 172. 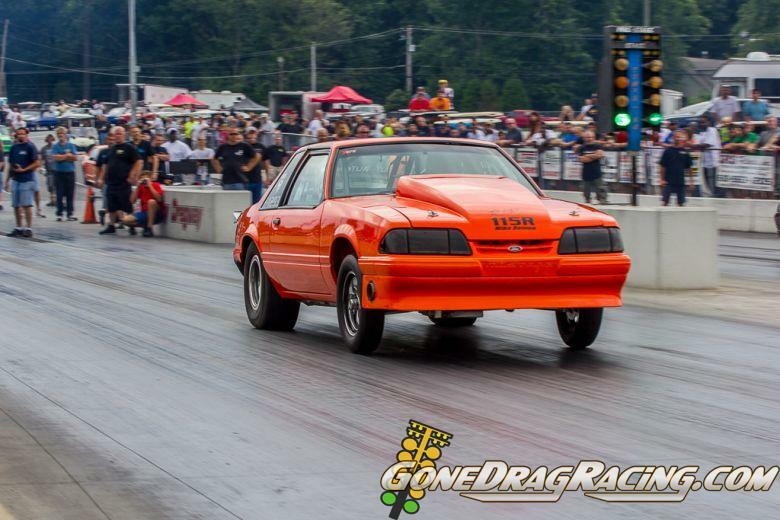 The #8 qualifier was Tim Essick who has been thrashing to get his car complete and ready for action the past few weeks ran a stout 4.384 at 174 in his small block Mustang for the #8 spot on the ladder. Tom Kasper of Gil Christy Motorsports and DiSomma Racing Engines was right on Essick’s heels with a 4.385 at 181 to take the #9. 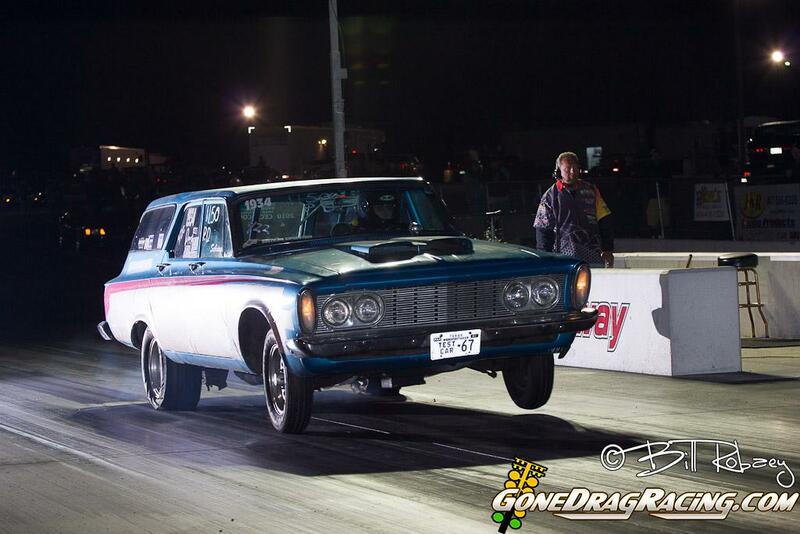 Kenny Doak in the amazing blown 69 Chevy held the #10 spot on the ladder with a 4.389 at a mere 147. 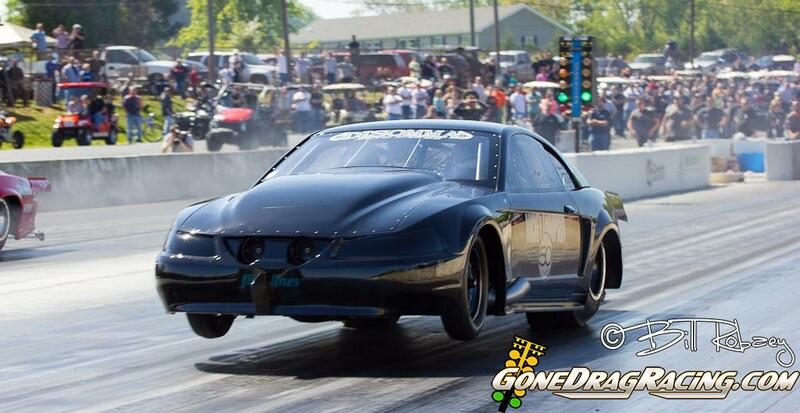 Anthony DiSomma who builds many of the motors in the Outlaw 10.5 class was #11 with a 4.412 at 178 but on DiSomma’s other qualifying pass he took low MPH of the event with a 192.66 hit. 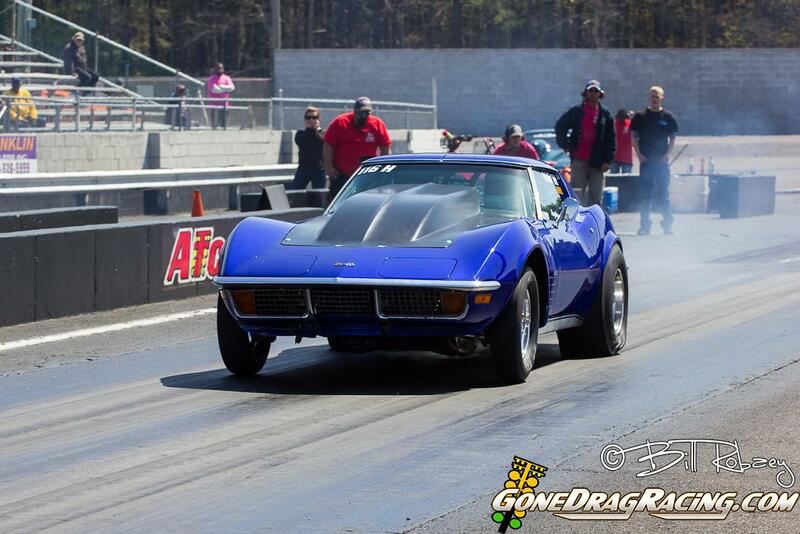 Bill Mitchell who last month brought out his new 2004 Corvette and has been making tons of progress on the new car took the #12 spot with a 4.426 at 179. 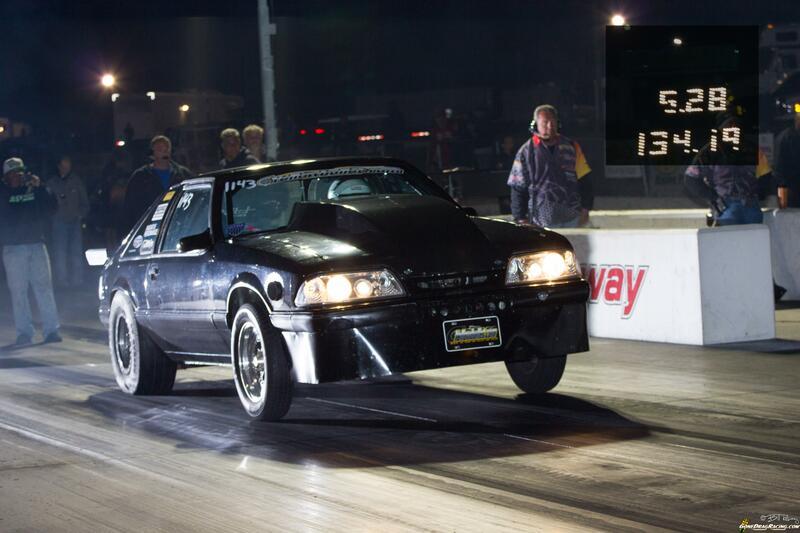 Steve Gorman the current points leader had the #13 spot in the order with a 4.476 at 181. 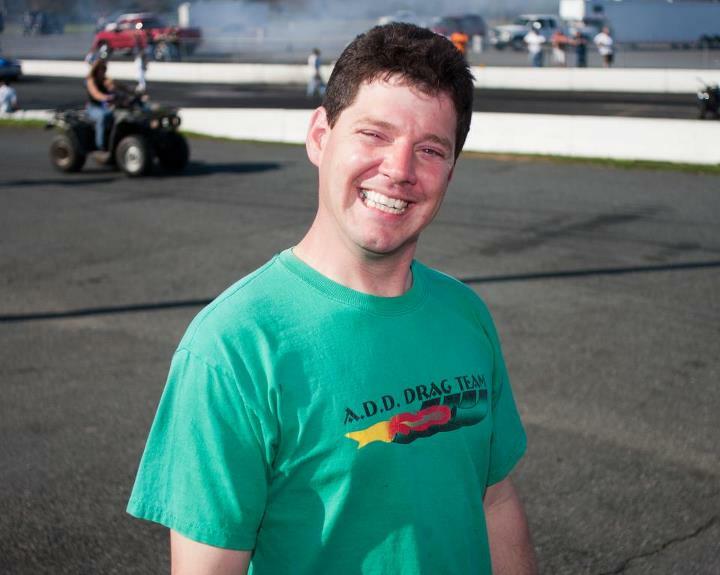 Scotty Guadagno the Brooklyn racer who can compete with the best racers in almost every class had the #14 spot on the ladder with a 4.492 at 163. Brad Harris and Shawn Zubler rounded out the 16 car field with Harris running a 4.508 at 177 and Zubler running a 4.52 at 166. The first pair up in round 1 was the #14 Scotty G and #3 Low Sciortino who both run EFI NOS combinations and saw Low Sciortino go up in smoke for Scotty G to move on to round 2. The next pair up was Kenny Doak of K&K taking on the Caldwell Motorsports Mustang and Kenny Doak running a 4.292 at 179 to move on over Dolbin who overpowered the track and spun the tires. The third pair up was the #8 and #9 qualifiers Tim Essick and Tom Kasper. Essick runs a 4.398 at 172 with his small block to take out Kasper who runs a 4.468 at 179. Joe Newsham who was #17 on the qualifying ladder came in as an alternate since T.J. Kasper couldn’t make it to take on Brad Harris with Newsham winning on a huge holeshot taking Harris out with a 4.648 to Harris’s 4.556. 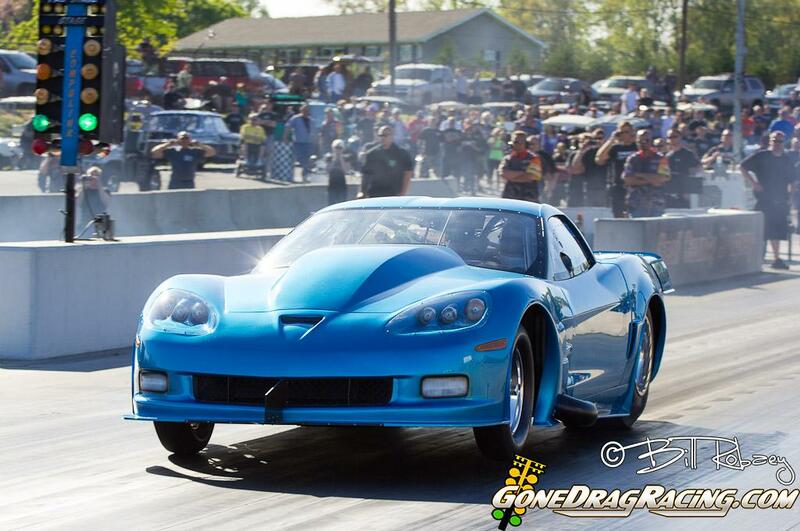 Bill Mitchell in his new vette was up next against the Fulton Powered Camaro of Mo Hall. Hall spun the tires and shut down so Mitchell moved on with a 4.38. The #1 qualifier Billy Gordon was up next taking on the #16 qualifer Shawn Zubler. Gordon took this with a 4.30 over Zubler who hiked the front end up in the air and drifted towards the centerline so he had to shut it down. Anthony Disomma and Larry Wood were up next with DiSomma taking out Wood with a 4.429 to Woods 4.441. The last pair up in round 1 was Steve Gorman and Harry Buck Jarvis. Gorman treed Jarvis with an 002 light to take the win with a 4.362 to a faster 4.325. Gorman who treed Jarvis in the previous round fell victim to the tree with a .114 light running a 4.384 to Bill Mitchell’s .007 light 4.434. The next pair up saw the #11 and #14 qualifiers of Anthony DiSomma and Scotty G. DiSomma took out the Brooklyn NY racer who had some troubles with a 4.415 over a slowing 4.784. #1 qualifer Billy Gordon was next up taking on the small black of Tim Essick. Gordon who has been very consistent the past few Streetcar shootouts takes out Essick with a 4.305 Essick and Gordon were dead even at the 330 but Essick had to get out of it slowing to a 4.413. Kenny Doak and Joe Newsham were up next with Doak showing how much of a class act he is waited for Newsham who had to replace his convertor twice taking the J&E powered Camaro with a 4.310 to Newsham’s 4.404. The Semi-Finals saw three of the four with twin turbo combinations. First up was Kenny Doak and Anthony DiSomma. Doak turned on the redlight giving this win to DiSomma who ran a slower but winning 4.461 to Doak’s 4.412. 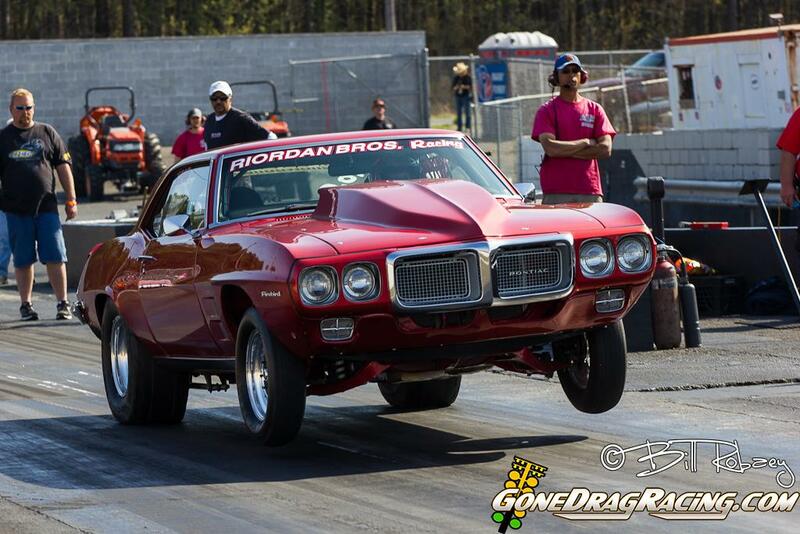 Billy Gordon and Bill Mitchell were up next and Gordon went low for the event with a 4.213 over Mitchell’s 4.38. 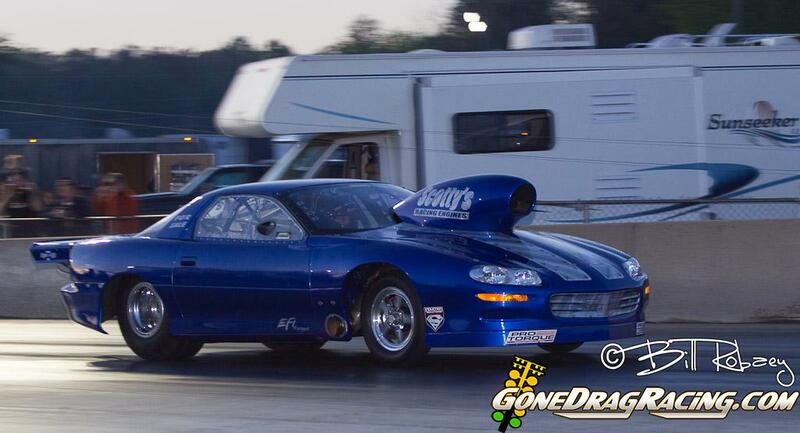 The finals saw Billy Gordon’s 2004 Mustang taking on Anthony DiSomma in his 2002 Camaro. 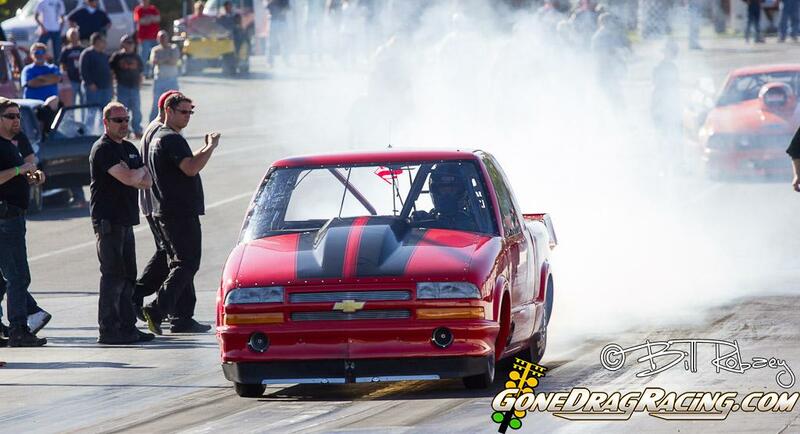 DiSomma had a low MPH on his 4.450 run of 169 to take the loss to Billy Gordon’s 4.23 at 192. Since the August Streetcar Shootout wasn’t quite as hot as the previous month the radial cars were able to get down the track easier. 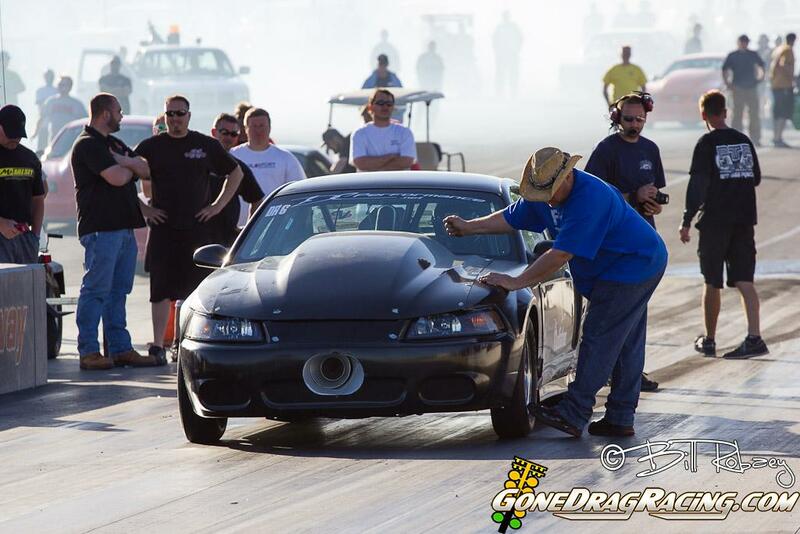 Frank Soldridge of PSI Motorsports in the 2004 Cobra was #1 with a 4.526 at 174 well ahead of #2 qualifier Bill Dutka in the J&E powered OAB Racing tuned 79 Malibu at 5.009 at 153. Bill has been working real hard in the Malibu and he currently sits #1 in points. #3 on the ladder was Chris Evans who has been battling some issues with a 5.211 at 142. 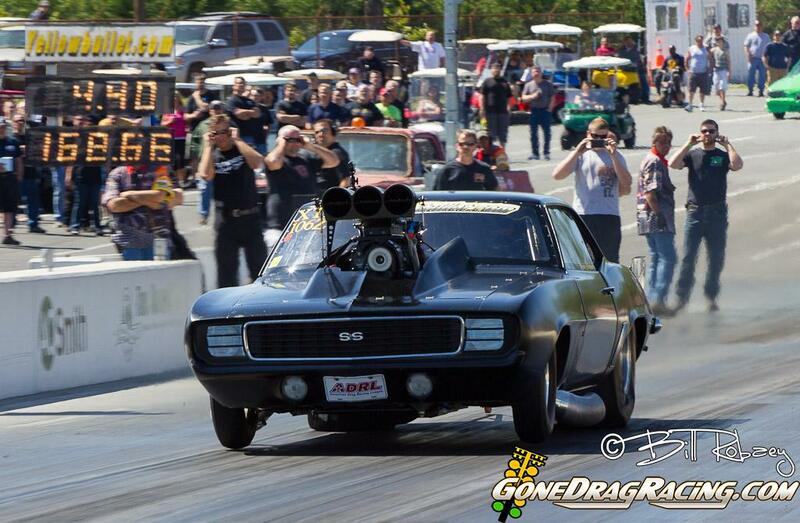 Robby George in his Camaro took the #4 spot with a 5.344 at 136. Steve Drummond driving a beautiful 68 Chevy sat in the #5 spot with a 5.375 at 149 and right behind him was Steve Willingham in the gorgeous 67 Mustang built by Drummond Racecars with a 5.771 at 141. 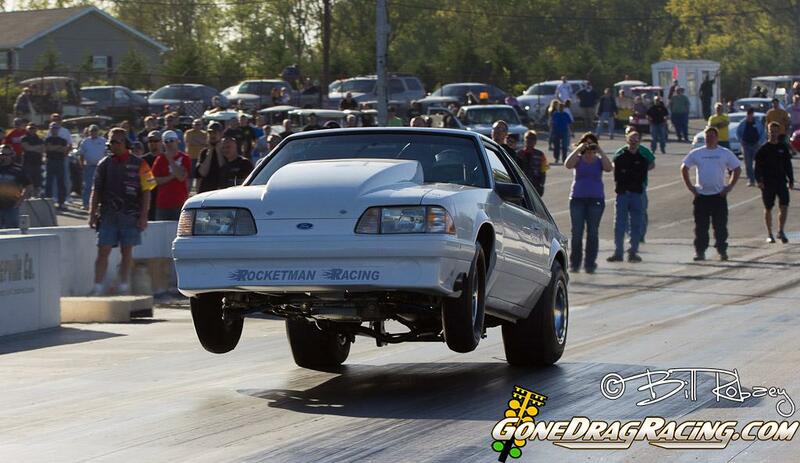 Ed Pfeiffer in the 93 Mustang who has a thread on Yellowbullet.com is making headway in his Mustang and continually improving each run. He sat at #7 on the ladder with a 5.800 at 120. In the #8 spot on the ladder newcomer Joe Giambanco ran a 7.303 at 124. 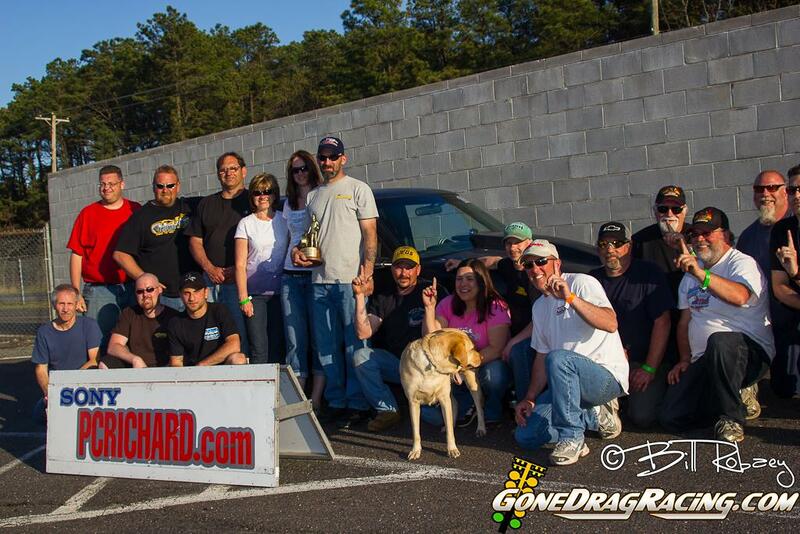 Eliminations on Saturday turned out to be a dominating performance by Frank Soldridge of PSI Motorsports. First round saw Bill Dutka taking out Ed Pfeiffer with a 4.829 at 167 to Pfeiffer’s 5.843 at 121. Steve Willingham in the 67 Mustang came up next taking on Big Green Chris Evans. Evans who has been dealing with some car issues hit the tree well but Willingham was a bit quicker on the tree and Evans wheelied and had to peddle so he came up short running a 5.57 to Willingham’s 5.295. 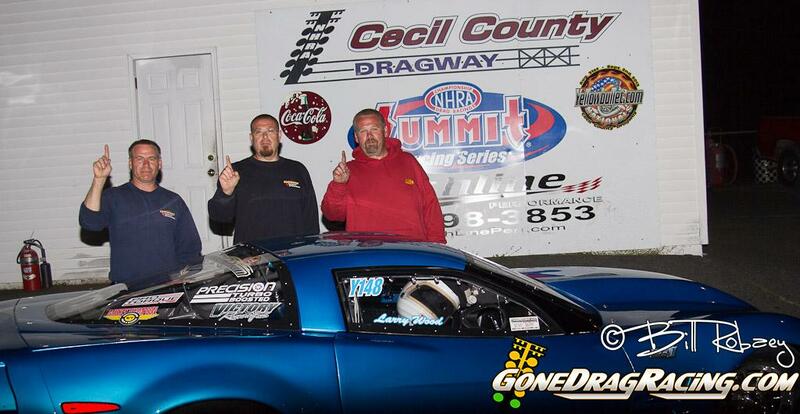 Steve Drummond and Robby George were up next with George taking the win light. 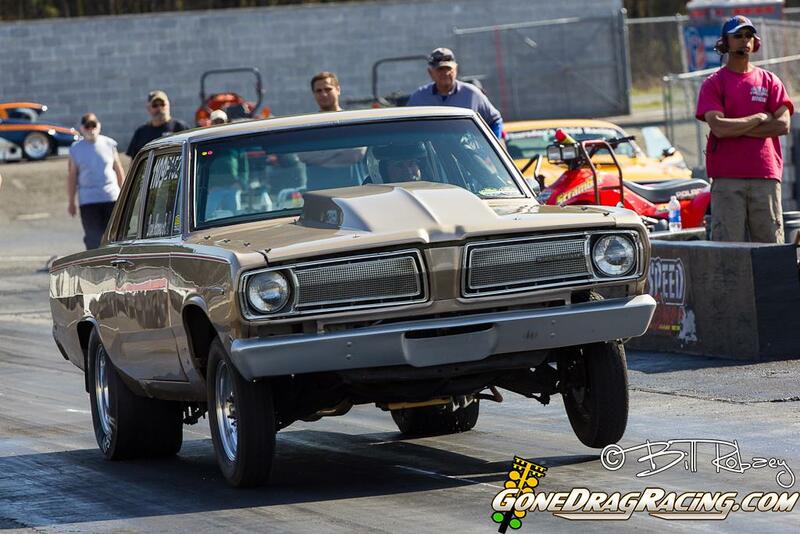 Drummond sat spooling the car up and went 5.13 his best time in the car but Robby George takes the win with a 5.31. The last pair up in the 8 car field was #1 qualifier Frank Soldridge and Joe Giambanco with Soldridge easily taking the win with a 4.53 to a slowing 6.68. 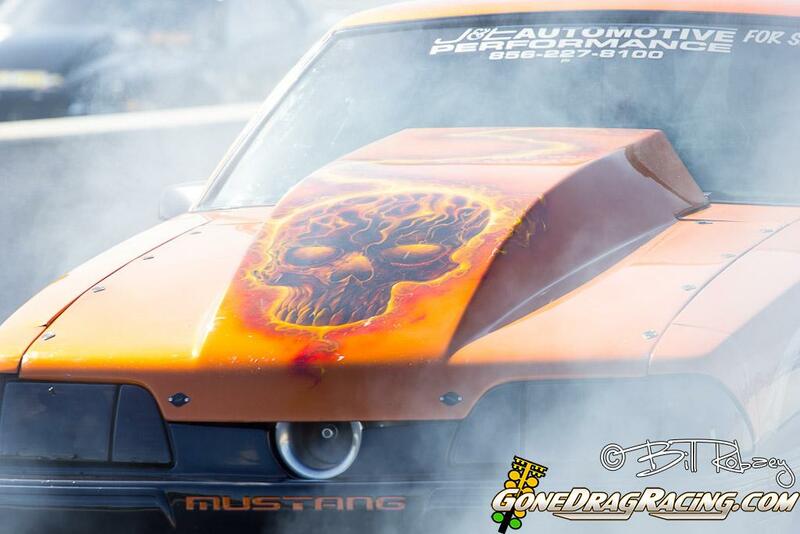 In the semis Bill Dutka who is going rounds at each Streetcar Shootout shows why he is the current points leader ran Steve Willingham taking him down with a 4.70 to a 4.95. The next pair up was a battle of Team PSI with the owner Frank Soldridge taking on Robby George. 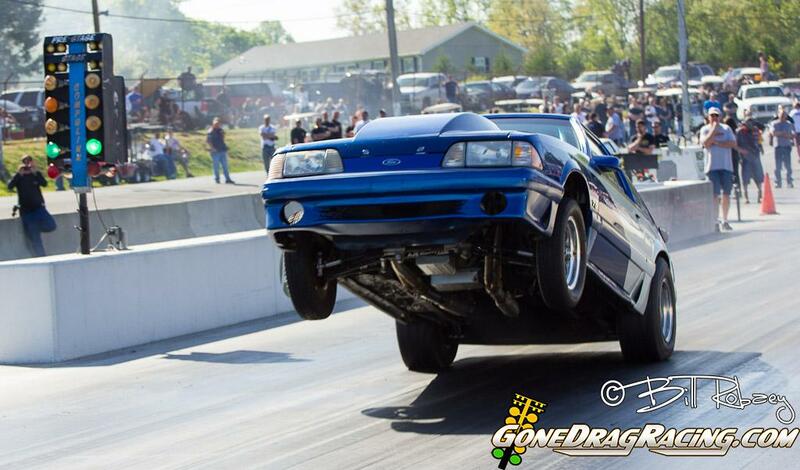 George had some issues and slowed to a 9.35 and Soldridge gets his car into the 4.40’s with a 4.496 at 176. The Finals saw #1 and #2 in the points do battle and Soldridge who is #2 and deadly consistent today took home the win with a 4.52 at 175 to Dutka’s 4.94 at 153. Outlaw Big Tire which has been pretty good as of late saw 10 racers trying to get into the 8 car field. 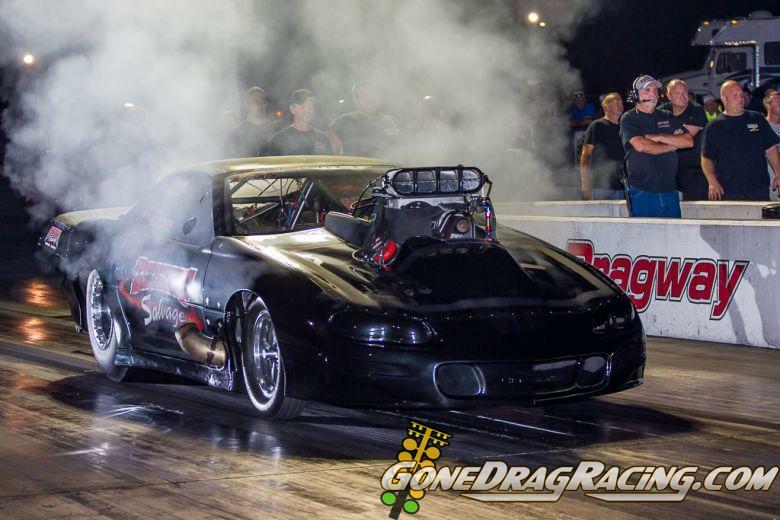 Tom Tarsia, last months winner qualified #1 with a 4.492 at 164 with John Schroeder who is back in action after missing the first few races with a 4.528 at 159. Charlie Boy Micallef the Long Island native ran a 4.619 at 157 to shore up the #3 spot. Roger Sterling in the beautiful red 2006 GTO formerly owned by Doug Harris ran a 4.706 at 152 to take make the field at #4. 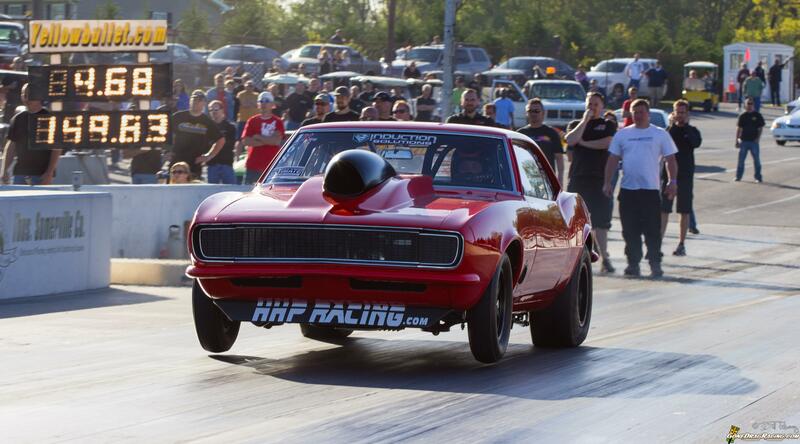 Joe Schroeder in the 69 Camaro ran 4.727 at 154 to hold up the #5 spot. 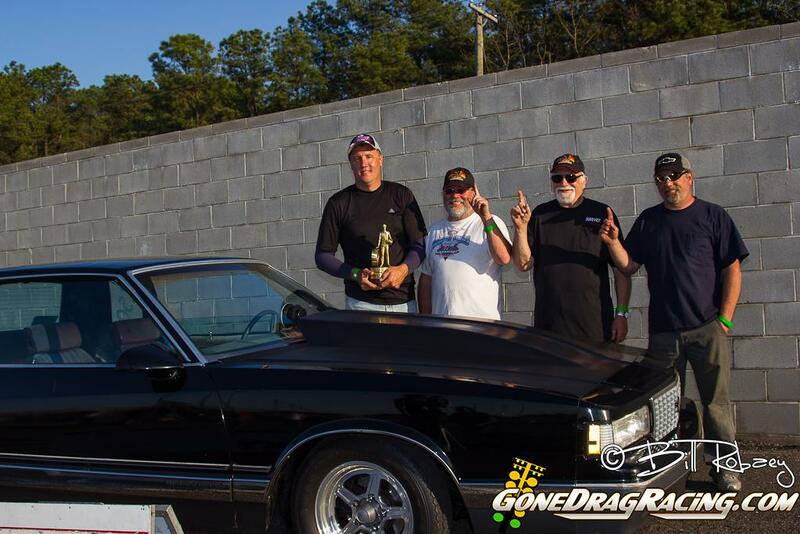 Number 6 belonged to Kevin Ashely in the procharged El Camino running a 4.894 at 148. 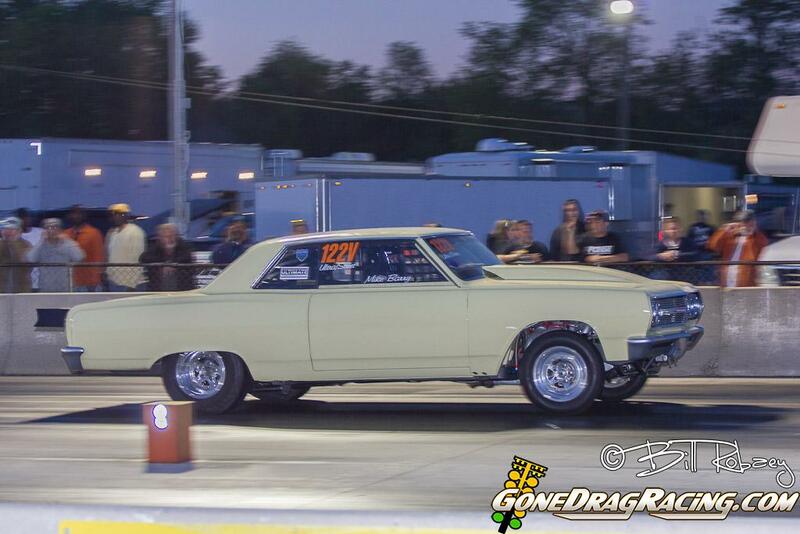 Number 7 was Jimmy Reutter in the 74 Nova running 4.945 at 146 and Rick Righter held #8 with a 4.986 at 142. Charlie Boy Micallef and Kevin Ashley were up first with Ashely fouling away the win but Charlie Boy who has been running very well ran a 4.61 to the losing 5.64. Roger Sterling and Joe Schroeder were up next and Sterling was very late on the tree, Schroeder hit the tree hard but blew the tires off so Sterling moves on to round 2 with a 4.508 in the N/A combo. Tom Tarsia and Rick Righter were up next and Tarsia takes this one as he has been running at the top for the last few races with a 4.49 over Righter’s 4.99. John Schroeder and Jimmy Reutter in a battle of nitrous entries has Schroeder step up and run a 4.51 over Reutter had some issues and ran a 9.66. In the Semi’s we saw the N/A setup of Roger Sterling and Tom Tarsia do battle with Tarsia moving on with a strong 4.52 to a losing 4.94. John Schroeder and Charlie Boy up next and although Charlie Boy steps up his E.T. 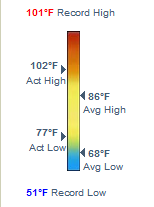 it wasn’t enough to overcome Schroeder’s 4.50. In the finals we saw Tarsia and Schroeder. Schroeder ran into some issues but Tarsia matches Sam Gottier’s track record with a 4.46 to take home his second consecutive win. X275 which has been a hot topic with rules lately saw 17 cars trying to qualify on the 16 car ladder. At the center of the rules debate has been the combination of Rich Bruder who is tuned by Mustang Mike Modeste. Bruder who was running the Procharger F1X along with the billet head has had to change setups back to the Procharger F1R. 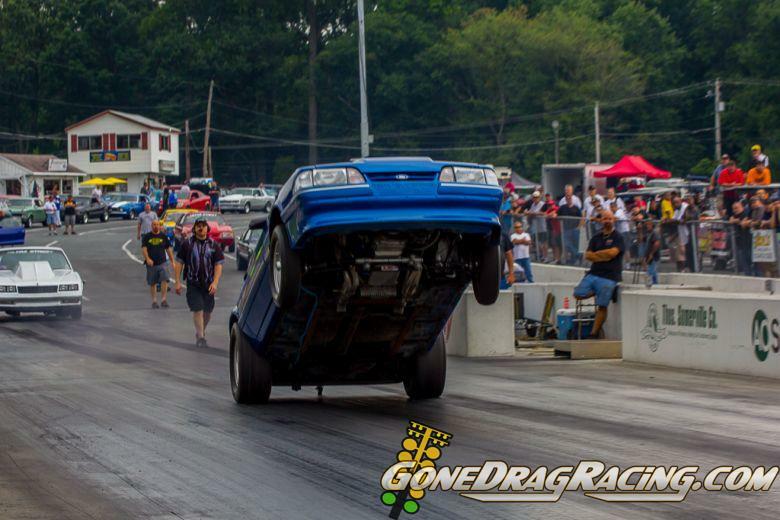 The Bruder Brothers and Mustang Mike even with all the debates around them came out testing on Friday and ran a 4.80 off the trailer. 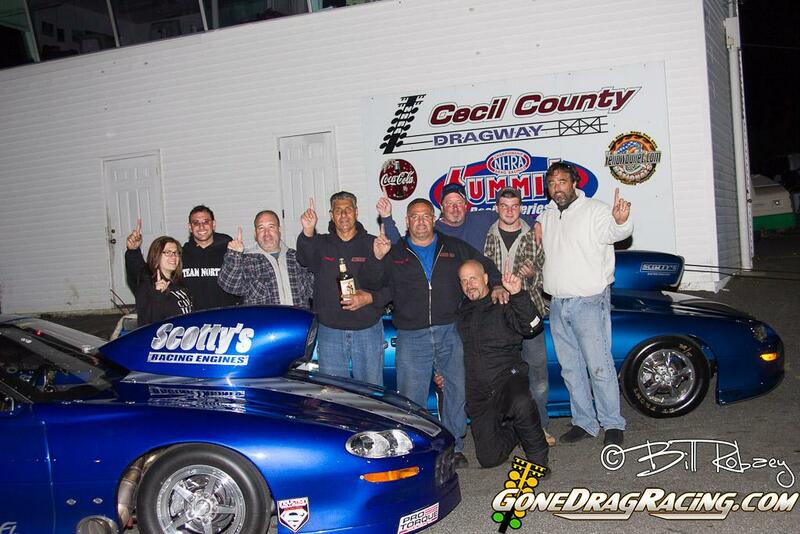 Qualifying this month didn’t see the Bruder Brothers #1 but instead Dean Marinis sat #1 with a 4.790 and 151. Rich Bruder was right behind him running a 4.805 at 150, Ron Rhodes of Rhodes Custom Auto said he’s only running one big stage today trying to figure out the progressive system. Rhodes didn’t look like it was to hard for him to fogure out running a 4.844 at 145. Mike Cerminaro sat #4 with a 4.963 at 144, Andrew Willingham ran a 5.066 at 138 for #5, Bob Clayton runs 5.076 at 141 for the #6 spot. 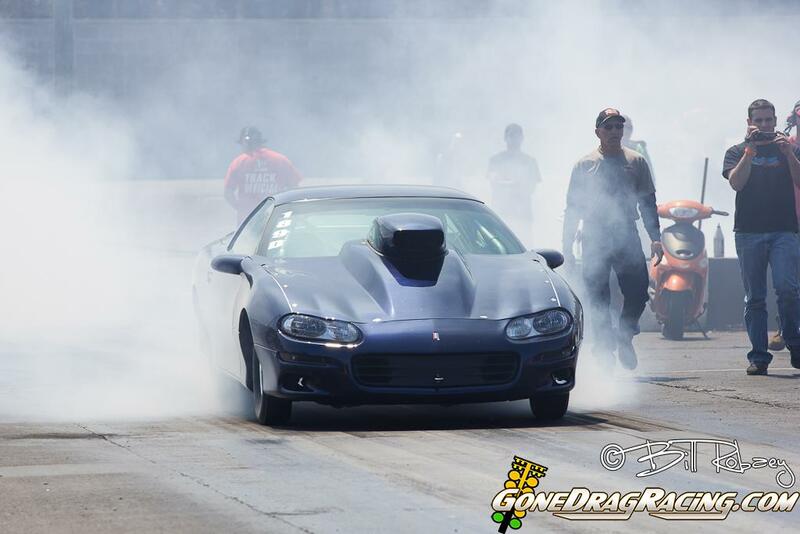 Frank Provenza who hasn’t been at Cecil for a little bit came out and qualified #7 with a 5.099 at 144. Number 7 saw Darrell Varner in the 85 Camaro run a 5.126 at 140, Steve Thompson in the HFR Mustang sat in the #8 spot on the ladder with a 5.156 ar 139, Vince Palazzolo in the 2002 Mustang qualified #10 with a 5.248 at 139, Jeff Beish in the 1987 Buick sits #11 with a 5.267 at 134, Tony Mullin runs a 5.323 at 137 for #12, Brendan Mills who we didn’t see here last month sits #13 with a 5.445 at 145, Craig Walls holds the #14 spot with a 5.569 at 141, Terry Kowalevicz Jr runs 5.679 at 133 and rounding out the 16 car field is David Winder Jr in the S-10 with a 5.778 at 122. First round saw Steve Thompson take out Darrell Varner who had issues on the line, Brendan Mills and Mike Cerminaro were up next with Mills taking out the number 4 qualifer with a 5.172 over Cerminaro who spun the tires. Frank Provenza and Vince Palazzolo were up next both had identical reaction times but the power of Provenza pulls out the win with a 5.004 to a losing 5.190. Ron Rhodes and Craig Walls were up next with Rhodes who has been in the 80’s all day takes the win with a 4.89 to a fouling 4.953. 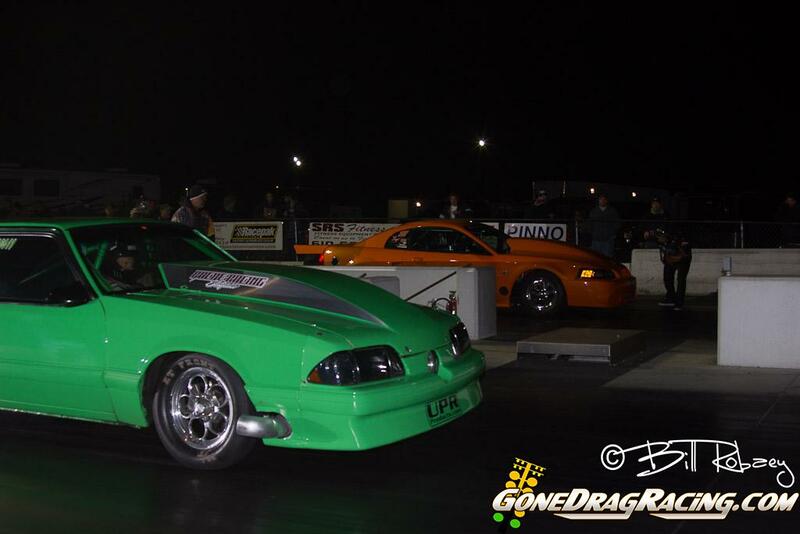 Jeff Beish and Bob Clayton were up next with Beish taking out the #6 qualifier with a 5.192 to a 5.424. The man with a target on his combination was up next with Rich Bruder running a strong 4.785 at 150 to put Terry Kowalevicz on the trailer. Dean Marinis and David Winder Jr came up next and the #1 qualifer runs a 4.857 to move on. The last pair in the first round were Andrew Willingham and Tony Mullin and Willingham steps up again running a 5.059 to Mullin’s 5.173. 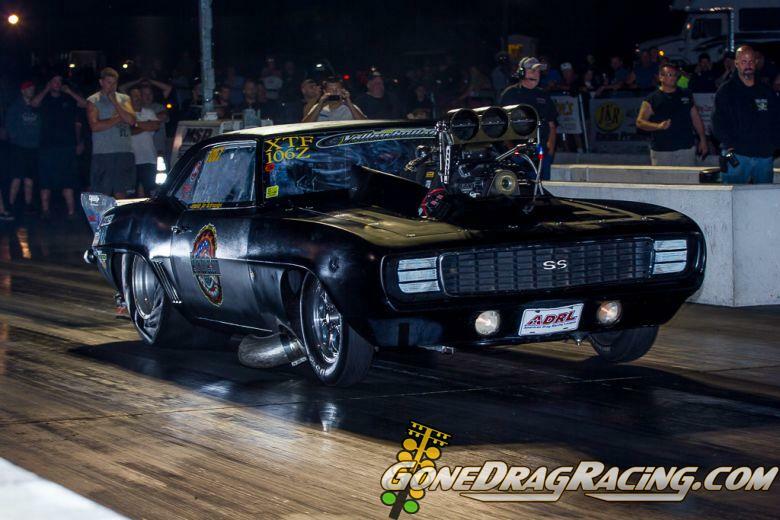 In the Semi-Finals the first pair up was Rich Bruder and Ron Rhodes in a tight race with Bruder running a 4.769 to Rhodes who runs a 4.819 which may be a personal best for Rhodes but it wasn’t enough. Dean Marinis and Andrew Willingham were up next for a chance to go to the finals and meet the Bruder Brothers. Marinis easily moves on with a 4.784 which should make for a great final. In the finals we had a burndown until track officials saw a leak from Marinis car so Bruder easily takes home his 6th event win in a row! 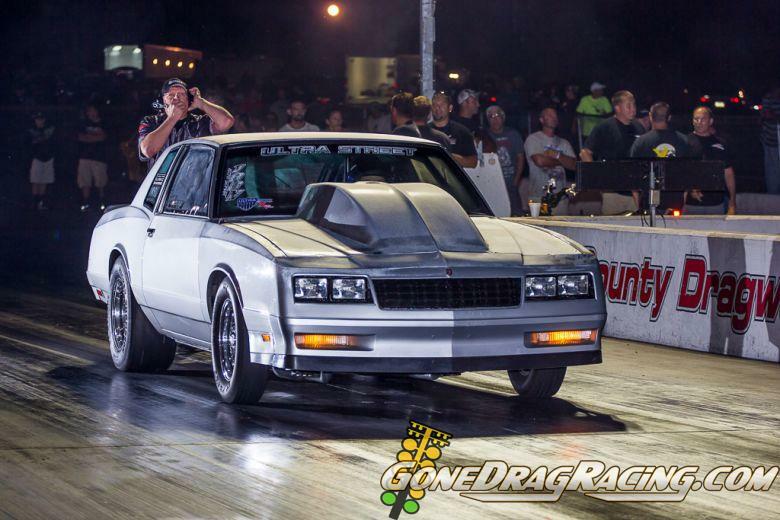 Ultra Street the new class that is building steam and becoming a very nice alternative to some of the other classes saw a full 16 car field this month at Cecil County Dragway. 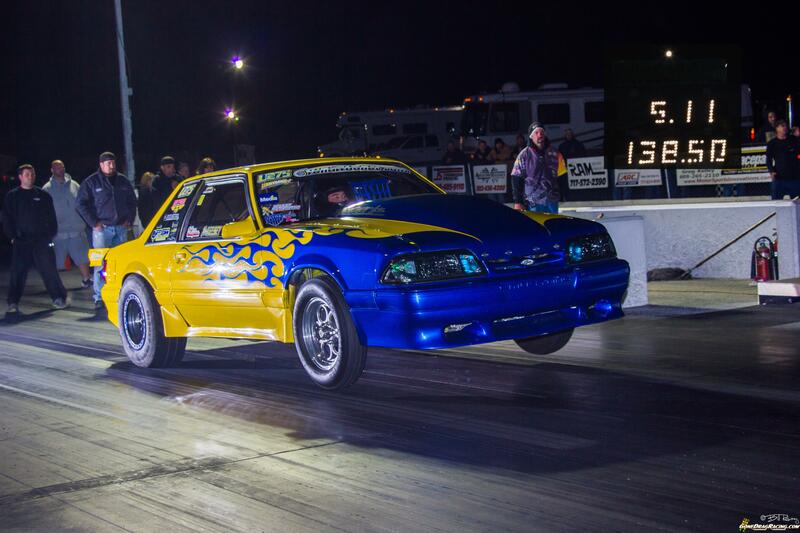 Number 1 saw Todd Geisler in the 79 Chevy Malibu run 5.342 at 128, Larry Rhodes at #2 with a 5.39 at an off pace 112, Dennis Lowman Jr #3 with a 5.466 at 126, John Keesey in the beautifully painted yellow and blow Mustang at 5.624 at 131, Jeff Moyer #5 at 5.667 at 132, Mark Dill 5.691 at 123, Mike Barry in the very nice looking 65 Malibu run 5.840 at 128, Chris Hartman 5.844 at 118, Casper Pigott 6.073 at 121, Dave Shakespear 6.142 at 111, Ray Branden 6.195 at 112, Marc McCloud 6.278 at 130, Scott Rudinsky 6.291 at 113, Dave Mizell 6.487 at 121, Armand Guzman 6.509 at 108, and rounding out the 16 car field was Joe Boywill at 6.956 at 103. 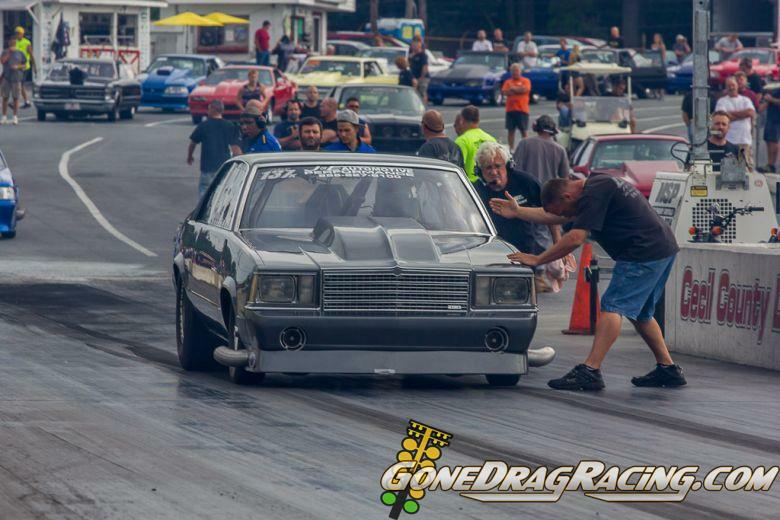 First round started with Mike Barry taking out Dave Shakespear with a 5.84, Mark Dill takes down Ray Branden with a 5.67, Chris Hatman takes out Casper Pigott with a 5.88, Mark McCloud who has had issues getting down the track today in the 88 Monte Carlo goes low with a 5.252 to put Moyer on the trailer. John Keesey runs a 5.696 to move on over Scott Rudinsky, Armand Guzmand and Todd Geisler bother have singles to move on to the second round. Round 2 had Mike Barry move on past Armand Guzman with a 5.39, Marc McCloud moves past John Keesey and improves upon his last round with a 5.233, Todd Geisler moves on to the semis with a 5.347 over Chris Hartman, and Mark Dill moves onto the semis with a single and goes 5.690. In the Semis we had Mike Barry and Mark Dill with Barry taking the win with a 5.345, Marc McCloud and Toddy Geisler in two very nice Ultra machines had McCloud move on with another run in the 20’s with a 5.249. The finals saw Marc McCloud and Mike Barry do battle with Marc McCloud taking home the win with a 5.212 over Mike Barry. Congratulations goes out to Marc McCloud and his team who now own the Ulta 275 record. 8.50 Index one of the classes at Cecil County that draws a good number of racers and one that spectators like to see. Twenty cars filled the lanes to try and run the numbers to get into the sixteen car field. Unlike last month when only the top five qualifiers were in the 8.5x range this month the top nine were in the 8.50 range with the others not to far behind. 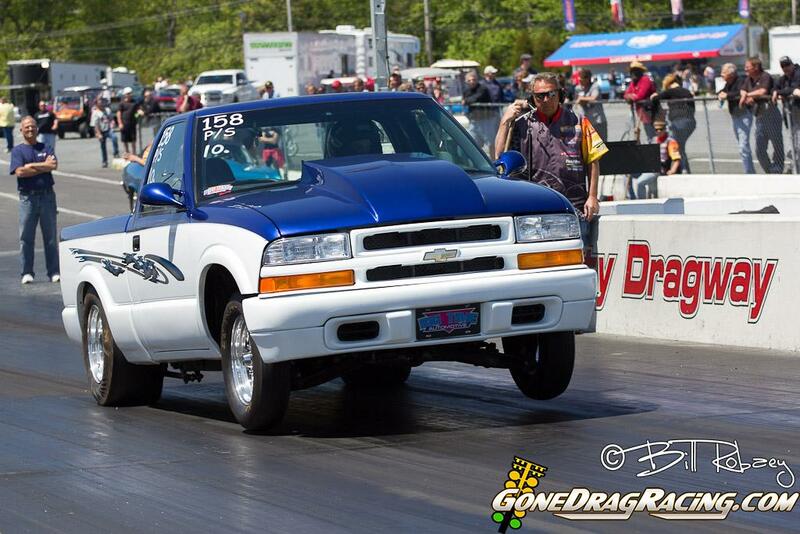 Brian Ferrari took home the top qualifying spot with an 8.508 and Lil Man Marty Brown right behind him with an 8.513. 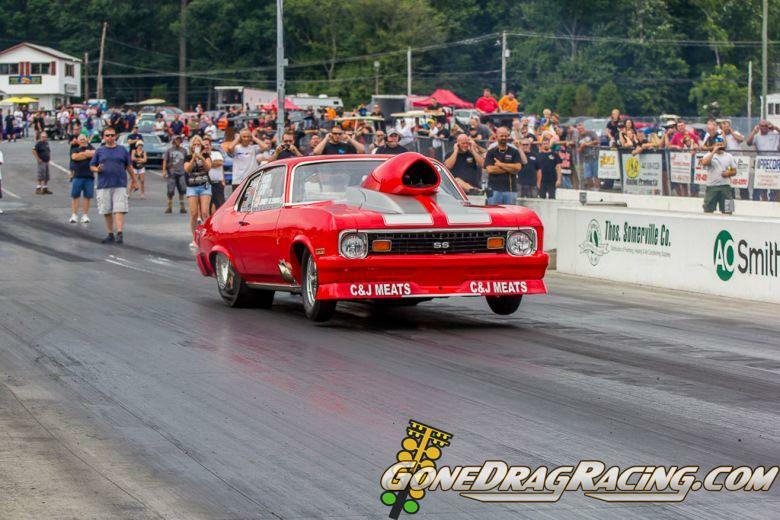 Luis Martinez followed with an 8.523 in his small block powered 8.50 entry and eventual winner Mike Good had the number 4 spot with Mike Doak Jr behind him in the number 5 spot with a 8.559. 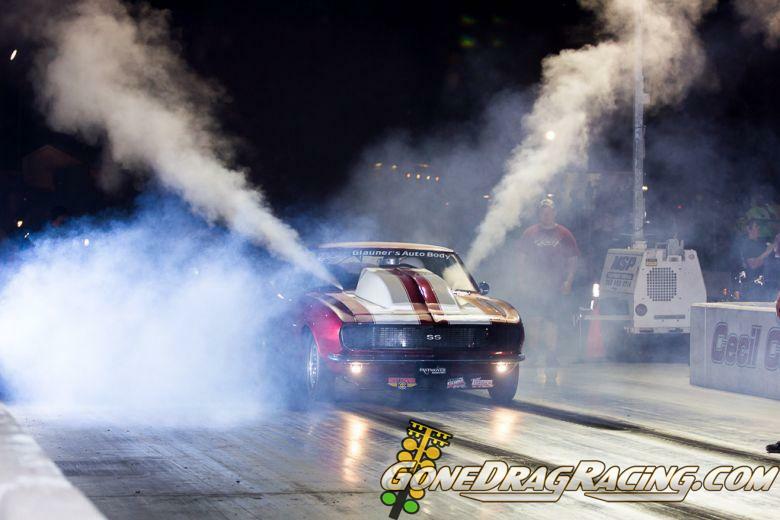 Eliminations in 8.50 are always exciting with close heads up racing and this month was no different with Marty Brown and Mike Good doing battle all the way to the finals. Marty Brown who qualified #2 started with #15 qualifer Bill Pedus in the first round and ran an 8.598 to Pedus slower 8.722. Mike Good on the other hand had the Fonse Performance Camaro first round and ran an 8.608 to the the Fonse Performance’s spinning 9.194. In the second round Lil Man had Mike Romeo Jr who qualified in the #10 spot and Romeo Jr who is always a tough competitor but Brown took the win this time with a 8.513 to Romeo’s 8.606. 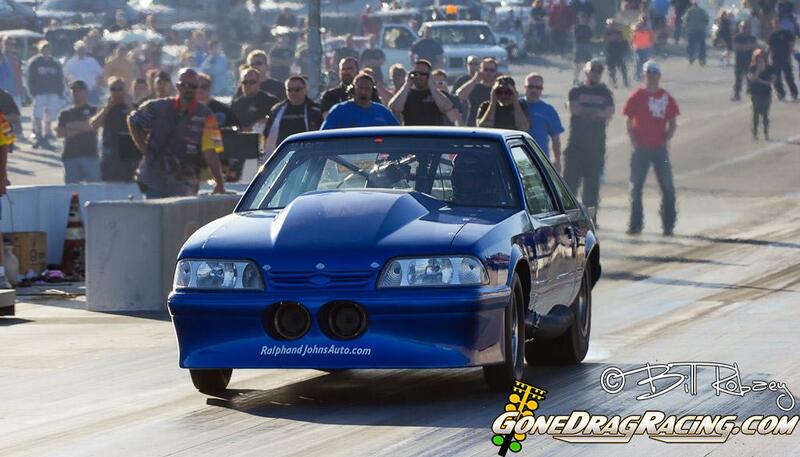 Mike Good lined up with the H&J Motorsports Firebird and ran an 8.564 to Harry Gerb’s 8.616. 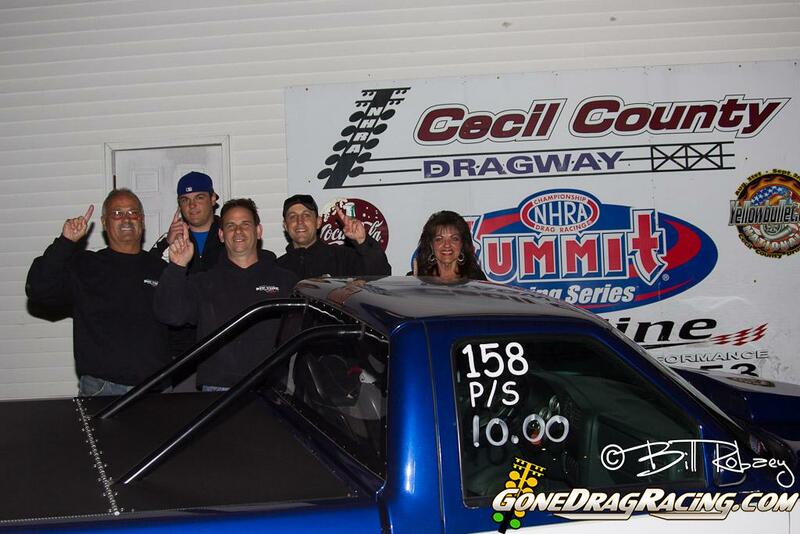 The semi-finals saw Mike Good, Lil Man Marty Brown, Brian Ferrari and Luis Martinez all competing for a chance to move onto the finals to take home the August race win at the Cecil County Finishline Performance Streetcar Shootout. The first pair up was Mike Good and #1 qualifier Brian Ferrari. Mike Good ran closer to the magical 8.50 number and moves in to the finals with an 8.516 to Ferrari’s 8.563. The next pair up was Luis Martinez and Marty Brown Jr. Martinez rolled the lights giving the win to Lil Man so he moves onto the finals to face Mike Good. In the finals both Brown and Good break out with Good running an 8.485 and Brown running an 8.476. Mike Good takes home the 8.50 win and moves into the #1 spot in points. 10.0 is another great class with a good amount of cars competing at each Shootout race with this one being no different. 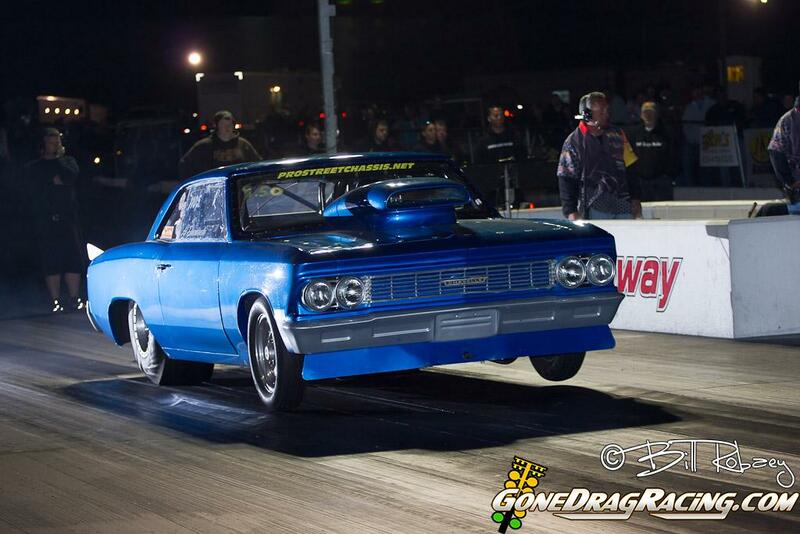 Fifteen cars were on the property with Carl Ungaro taking home the top qualifying spot on the ladder with an impressive 10.001 in his 67 Chevelle. 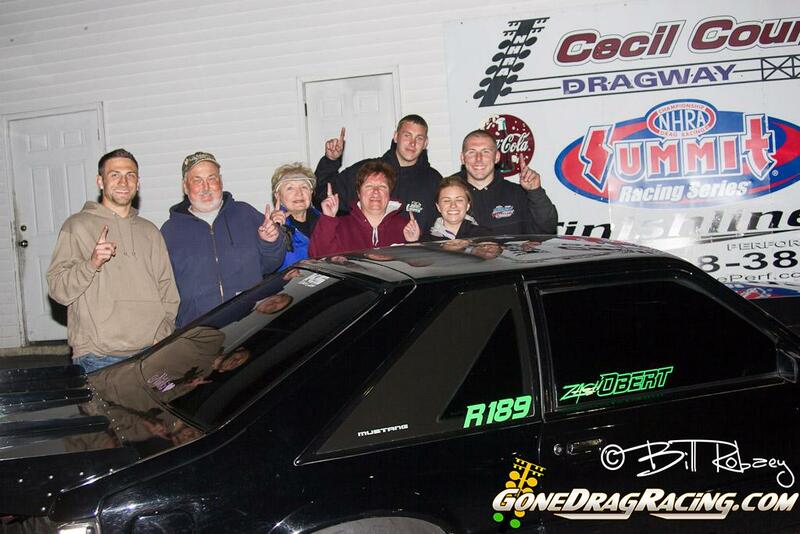 Right behing Ungaro was Mark Plucinski who is #2 in the points with a 10.007. 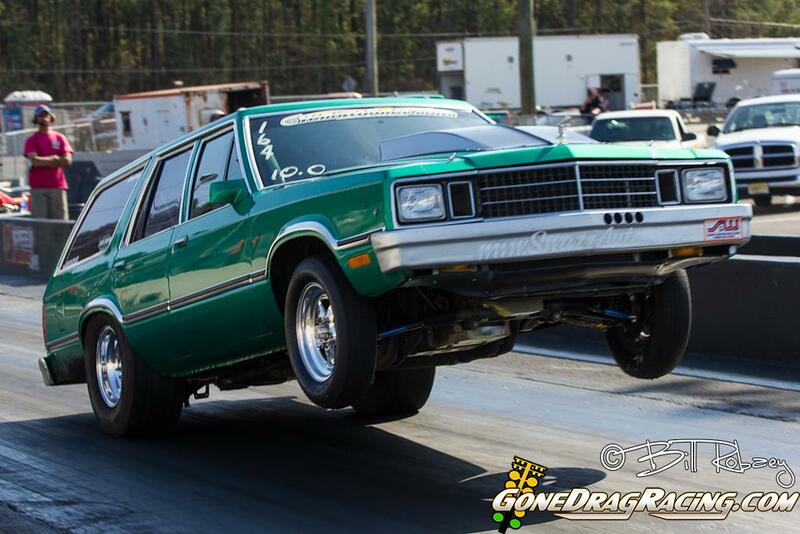 Thomas Wood in the 1984 Buick Regal is always a crowd pleaser when he pulls into the beams and hikes the front end up each run qualified #6 with a 10.038. 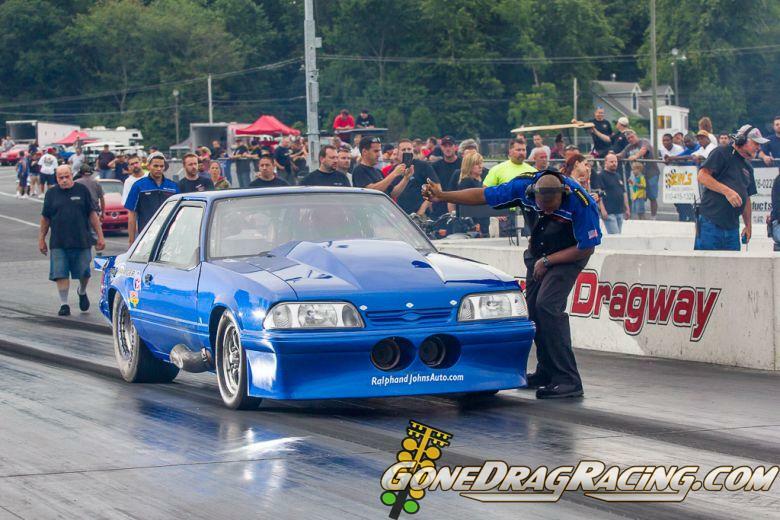 Christian Benedict from West Babylon NY had a great day racing in 10.0 qualifying with a 10.045. The first round of 10.0 Index Christian Benedict and Matt Jewell were the first up with Benedict killing the tree with an .002 reaction and running to a 10.103 over Jewell’s slower 10.169. When Mark Plucinski and Keith Reis Jr came up to the line Reis Jr hit the tree with an .008 reaction and Plucinski broke out running a 9.995 trying to catch Reis Jr. Number 2 in the points exits early this race. One of the best races of the first round belonged to Carey Cable and Thomas Wood. Cable treed Wood and ran a 10.067 to Woods faster but losing 10.063.Carl Ungaro the top qualifier in the 10.0 index ran a single to move on the the second round. Second round saw three of the four pairs have red light wins. Number 11 qualifier Carey Cable upset #3 qualifier Kurt Wilh when Wilh fouled givng the race to Cable. Christian Benedict and Carl Ungaro faced off with #8 qualifer taking out the #1 qualifier. Ungaro hit the tree hard coming very close to red lighting with an .001 light but Christian Benedict wasn’t to far behind him with an .014 light and a dead on 10.000 to Ungaro’s 10.020. Semi final action saw Rob Ward, Carey Cable, Christian Benedict and Rich Sosnowski. The semis also saw battles of Ford, Chevy and Dodge. First up was Rob Ward in the 92 Chevy and Carey Cable in the 72 Nova. Cable red lit handing Rob Ward a trip to the finals. Christian Benedict and Rich Sosnowski were up next with a chance for a trip to the finals. Both cars slowed down considerably with Benedict taking the win light with a 10.343 over a losing 14.37. The finals saw Christian Benedict and Rob Ward and a Chevy Ford matchup. 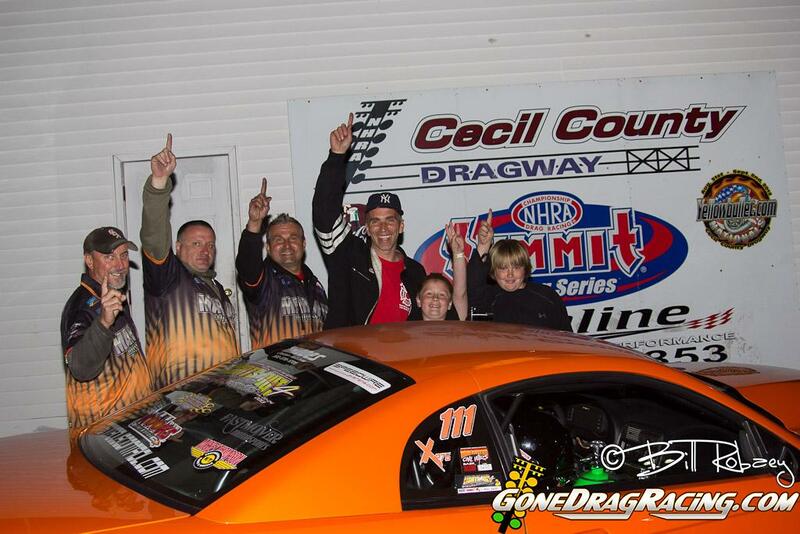 Benedict who has been very good on the tree forced Rob Ward to try and hit the tree hard and unfortunetly went red with a -.004 light to give Christian Benedict his first 10.0 win at Cecil County Dragway. 11.50 Index is a class at Cecil where the racers just like the 8.50 and 10.0 class see some great side by side runs and this month was no different. Jim Schmidt qualified #1 with an 11.545, John Secor was right behind him with an 11.568, and #1 in the points Steve Gurnick qualified #3 with an 11.569. The story today was Keith Huffman in his 72 Chevy who sits #2 in points but qualified in the #16 spot and mowed through a tough field. 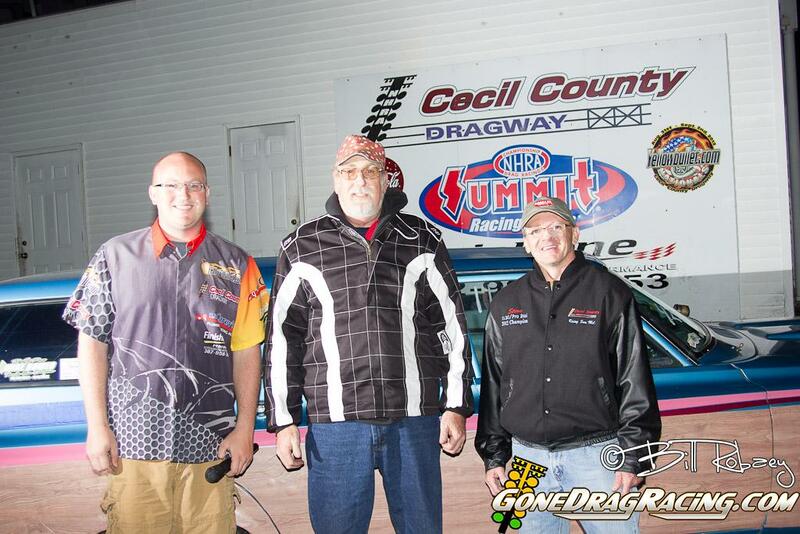 During Eliminations, Jim Schmidt who qualified #1 took on Keith Huffman and Schmidt was slow on the tree giving the win to Huffman with a 11.545 to Huffmans winning 11.548. Round 2 saw much of the same close racing with Steve Gurnick running an almost perfect light with an .002 to Donte Garrett .080. Gurnick ran an 11.666 to Garrett’s faster 11.606. Huffman ran a nice 11.52 in round 2 to take out Michael Carchidi who ran way under with an 11.217 to end his day. The semis finals saw Steve Gurnick, Rocco George, Keith Huffman and Michael VanDenHeuvel line up with chances of making it to the final. 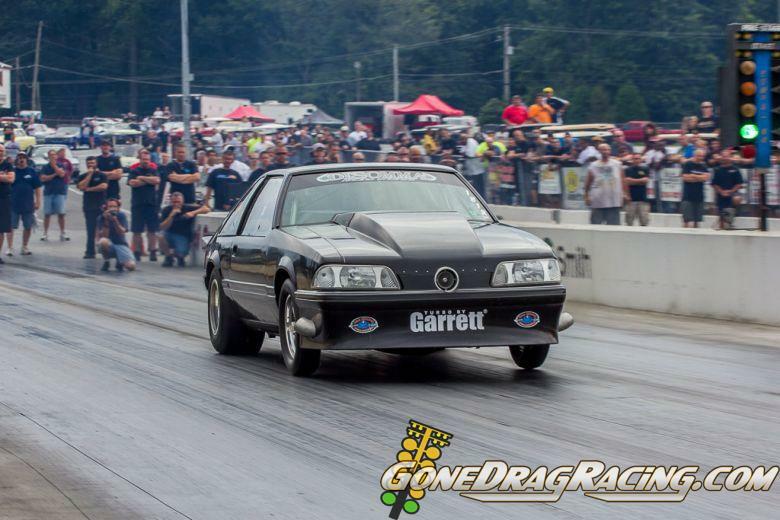 Gurnick who is #1 in points was slow on the tree but he was able to chase down Rocco George beating him with a 11.579 to the slower 11.696. Huffman who is coming out of the #16 spot faced off with VanDenHeuvel and both cars run under breaking out but Huffman moves on to the finals with a 11.498 to an 11.487. Keith Huffman and Steve Gurnick faced off in the finals with another double breakout and Huffman was able to run closer to the 11.50 mark with an 11.496 to a losing 11.479.